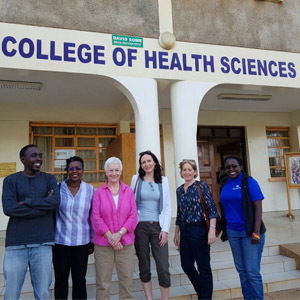 In February 2018, patient advocates Mimi McCord and Maggie Blanks and journalist and author Kat Arney travelled to Eldoret, Kenya, where samples are being collected for the Mutographs project. 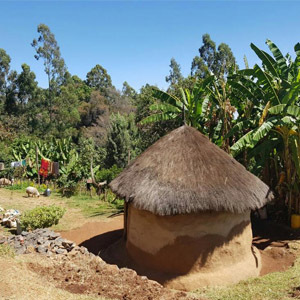 In this guest post, Kat explains why they went there and what they discovered about oesophageal cancer in East Africa. This is an edited version of an article that first appeared on the Cancer Research UK blog. At its heart, cancer is a genetic disease. Changes in important sections of DNA cause cells to grow out of control, forming a tumour that eventually spreads around the body. Some of these changes are due to DNA damage caused by exposures in the environment and certain lifestyle behaviours. The basis of cancer prevention is to work out what causes these types of changes, and then find ways to prevent cancer from starting in the first place. One mission of the Mutographs project is to examine DNA from 5,000 cancer patients across five continents, looking for tell-tale ‘signatures’ left in DNA by cancer causing factors. This mission focuses on five types of cancer: pancreatic, kidney, oesophageal squamous, oesophageal adenocarcinoma and bowel. All are unusually common in certain parts of the world, and all are suspected to have significant preventable causes. The challenge is finding out what they are. Arriving at the College of Health Sciences at Moi University in Eldoret, Kenya. Photo credit: Kat Arney. Research like this involves people: patients and their families, healthcare professionals and scientists in many locations. It was important right from the start to find out more about the experiences of patients in different countries involved in the project and discovering how best to engage them and the wider population with the research. The Mutographs team includes two patient advocates – Mimi McCord and Maggie Blanks. Both women lost their husbands to cancer (oesophageal and pancreatic, respectively) and are passionate about understanding and preventing these diseases for the sake of other families. In February 2018, I went with Maggie and Mimi to Eldoret in western Kenya, around 300 km north-west of the capital Nairobi. This region is affected by unusually high rates of oesophageal cancer. Even in the UK, survival from oesophageal cancer is poor. In Kenya, many of these cancers are diagnosed at a late stage once a patient is no longer able to eat and has become very frail. Often there are multiple cost and time barriers to reaching hospitals. People may also have spent time seeking help from traditional healers first. Access to healthcare is also very difficult for the majority of people living in rural areas. Assuming someone can make it to hospital, the most common treatment is surgery followed by the insertion of a tube, known as a stent, to keep the oesophagus open. A stent offers an improvement in the person’s quality of life, allowing them to eat and drink again, and a few months of extra life. However, palliative care is scarce, with most hospices only offering day care and limited forms of painkilling morphine. 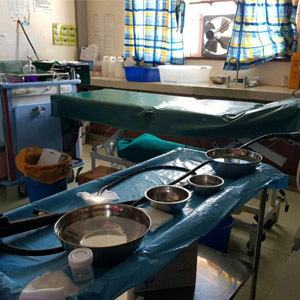 Surgical equipment at Moi Teaching and Referral Hospital, Eldoret. Photo credit: Kat Arney. As with any type of cancer, prevention is always better than cure. But although the scale of East Africa’s oesophageal cancer epidemic can be seen clearly in hospital statistics and personal stories – one woman we spoke to had lost both her parents to the disease within a few years – there is little known about what’s causing it. This is where the Mutographs project comes in. – Analyse the DNA to look for signatures that might reveal the culprit responsible for their disease. But carrying out this kind of research in a country with comparatively less well-developed healthcare and research infrastructure is challenging. The Mutographs team is working to identify and recruit the 5,000 patients that will participate in the project. In Kenya, we were able to include an existing study started by Dr Diana Menya at Moi University, in collaboration with Drs Valerie McCormack and Joachim Schuz at IARC. Their project, ESCCAPE (Esophageal Squamous Cell Carcinoma African PrEvention research), is recruiting oesophageal cancer patients and studying their environmental and lifestyle factors. By working together with Dr Menya and her colleagues, the Mutographs team were able to include tumour and blood samples for DNA analysis, matching them to the information gathered through ESCCAPE. It’s easy to predict some of the ‘usual suspects’ for squamous cell oesophageal cancer: alcohol and tobacco use are already known to significantly increase the chances of developing it. There may also be inherited, environmental and lifestyle components, which will hopefully be teased out by the Mutographs project. In a rural community outside Eldoret we visited two women, Ann and Emily. Their houses were in the traditional style – a single unventilated room with mud walls and a straw roof. The ceilings were covered with a thick layer of soot, hanging down in some places like stalactites. Emily was cooking lunch over an open fire. The smoke was overpowering – Mimi managed just 15 seconds before having to dash out for air! This smoky environment is awash with polycyclic aromatic hydrocarbons (PAHs), chemicals that are released from burning common local fuels such as wood, maize cobs and cow dung. 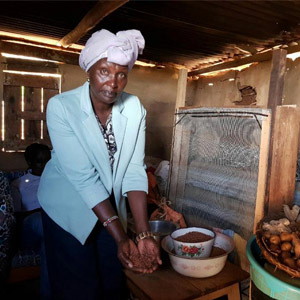 Women and children are particularly exposed to PAHs as they spend the most time in the kitchen, often sleeping in there at night to keep warm and safe. There are also personal habits. It’s common in Kenya to drink tea so hot it will scald your mouth – a habit that has been linked with oesophageal cancer in Iran and in parts of South America. Although it’s easy to suspect many things as being behind the high oesophageal cancer rates in Kenya, we don’t yet know how to identify most of these risk factors or recognise the marks they leave behind in DNA. And that means we don’t know which of them are the most dangerous, or how they might combine to cause cancer. Right now the Mutographs team are in the process of collecting patient data and samples. These are sent to IARC in France for processing. The resulting DNA is shipped to the Sanger Institute for analysis. Once the results start coming in, the Mutographs team can start the tricky process of trying to match the mutational signatures to the culprits. Alongside our investigations, we are also thinking about how to make sure any results can be communicated to the right people. We met many people involved in cancer treatment and care in Kenya: Dr Menya and her team, surgeons, palliative care specialists, local dignitaries, and families who had lost loved ones to oesophageal cancer. Unfortunately, we weren’t able to speak with any patients due to their frailty. We wanted to know what life was like for patients and their families and what they wanted to see change. Some of the key things that came up in our conversations were the need for more healthcare services in rural areas, and for ways to diagnose oesophageal and other cancers earlier. There’s also a need for more awareness of the symptoms of cancer and ways to reduce the risk. We spent some time talking with a local health minister, Kiprono Chepkok, thinking about how he and his team could use tools such as local language radio, community meetings or even phone messaging to spread health awareness and cancer prevention messages. We gained a lot of important knowledge and insights from this trip and came home feeling exhausted but more determined than ever to do what we can to make a difference to the lives of people living with cancer, wherever they are. Read a more indepth feature from Kat about the Mutographs project and oesophageal cancer in Kenya on the Mosaic website.